What does it take to live a better life? More money surely helps, but it isn’t the whole story is it. Take a look at the pyramid below. At the base of the pyramid, are the money elements of a comprehensive financial plan. But as the pyramid shows, these are the foundational elements only. They are just the building blocks towards achieving higher objectives in life. How much should I be contributing to super? What can I do to be more tax-effective? We begin by asking you questions. Lots of them. If I had more money, I would…. I am happiest when …. I have always wanted to …. Through our process, you will be asked to think deeply about your life and what you value most. After all, your values are the starting point to which all your money decisions should align. 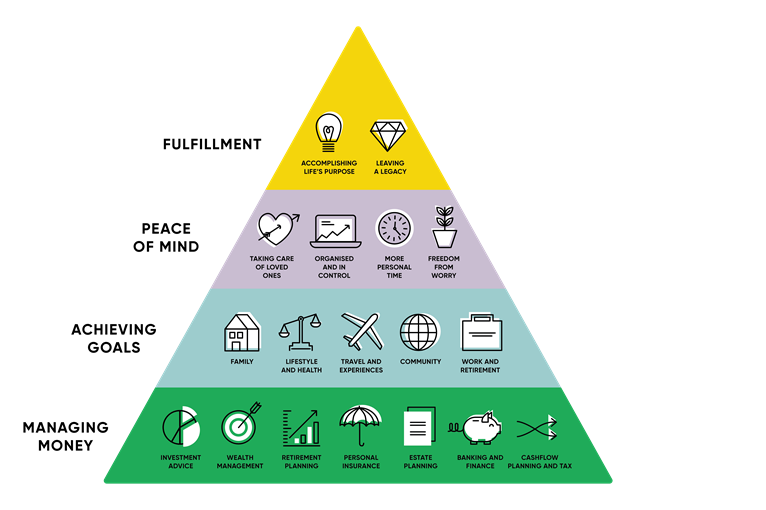 Together, we will determine all the elements of your own Purpose-based Planning Pyramid. Then we will set about putting a plan in place to achieve them. If you are still unsure if we are the right fit for you, read on. Have ever used a website like TripAdvisor or Airbnb when planning a holiday and searching for a place to stay? If you have, you will have almost certainly used filters to narrow down your search and there are two kinds of filters that you use. These are known as pre-filters and post-filters. Pre-filters are things like number of bedrooms, bathrooms and amenities such as a washing machine or Wi-Fi. Once you have your short-list from the pre-filters, you then use the post-filters to make your selection. The post-filters are the star ratings given by other guests and the written reviews they write about their stay. In this example, you obviously apply your pre-filters first. You don’t want to book a one-bedroom apartment with great reviews when you are holidaying as a family. We draw your attention to this distinction because even though choosing holiday accommodation is nothing like choosing a financial adviser, the concept of pre and post-filters is a useful model to use. Without a simple online filtering process readily available to help you make your choice, you might be tempted to jump straight to the post-filters without really knowing some of the differences between advisers. These differences are very well-known within the advice community and may be especially relevant to you. We’ve detailed in the table below some of the Pre-Filters you may like to include in your deliberations. A complimentary introductory conversation to see if the adviser is a good fit for you.